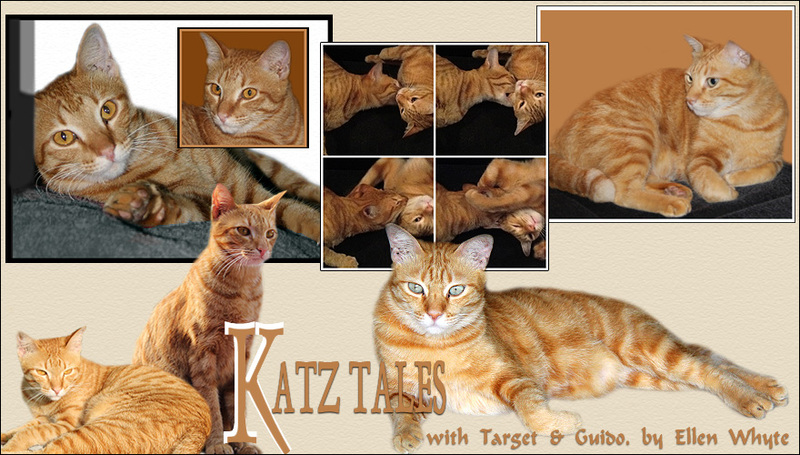 Katz And Other Tales: COT: Feed Me! There's chicken on the counter and Au is making sure that his male survunt keeps up to the mark with the carving by shouting MEOW! at 3 second intervals. Aus' MEOW is like a fog horn and as you can see from the pic, he never takes his eyes off the prize. When he does finally get his plate of chicken, he has to share it with the fur brain. But Au doesn't mind because he knows that another bowl is just a MEOW away. Love romance? Check out Blackmail Bride, a tale of passion and mystery set in Scotland. Price RM7.56/US$2.32. Instant delivery, no post charges. 10% goes to Friends Furry Farm, a no kill animal shelter. WOW! So that's what we heard! Of course, we're that loud for chikkun, too. We'll have to try the 3-second interval technique on Mommy. We're impressed with his focus and determination! Au gets the chicken... shares the chicken... and gets more chicken! Oooo...Au..what a chickenilicious ideas. Meow at 3-sec interval and chicken is delivered. I like that. purrrr.....meow! Must be interesting to hear a foghorn in the kitchen. Evidently it works. Looks tasty. Oooohhh ... so that's the trick to get "chikkun" ..... thank u so much! Au you are such a beautiful color. Keep that meowing up it can only bring more chicken! It's nice that you share. Hmmm looks delicious, I need to try chicken some day! Please mommy??? WOW, a fog horn meow AND chikkun!!! 3 second rule too - good thinking!! Au, mommy and I are impressed with you and your ability to get chikkin! I need to try the same thing! 3 second intervals? Got it. Will do. Arthur is an opera singer when he starts ! And with chicken he gets crazy ! Au, i has a loud meow too! Visiting from Cats on Tuesday! Mmmm...that looks worth meowing loud for!! Looks like Au is good at giving commands! LOL! but nicely shares as well. I love how all his whiskers and ears come forward in anticipation of a yummy treat! Living In Malaysia: Want Blue? Wordless Wednesday: Cat Fights Paw-Parazzi!